I am happy to announce I've added a new topic to my list of keynotes, conference break-outs and 1/2 day onsite seminars. It's entitled - Debunking Diversity! I have needed to add this to my portfolio for a long time, but have resisted because I didn't want to do just any traditional diversity offering. I decided to add it because I believe many offerings around this subject do take a traditional approach and in doing so minimize the impact desired. I think sometimes approach matters, particularly with a popular and somewhat difficult topic and we certainly don't want attendees or employees saying again, "Oh no - not that topic!" I hate when "training" is seen as torture and many times it is. So what's the traditional approach you ask? Traditional in my view is when diversity is approached primarily through the lens of race and ethnicity and here's the irony -- reducing the view of diversity through this minimal criteria makes it -- well -- less diverse! My view and experience with diversity is shaped growing up bi-racial. 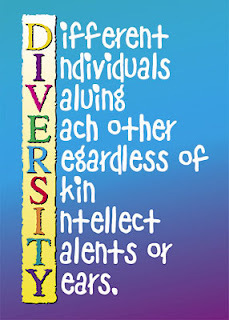 And so, it is my goal to make the understanding of diversity more diverse and in doing so, I believe people will begin to see they are way more accepting and more like those they otherwise would think they have little in common with. The topic/delivery is mind opening, heart opening, fun and entertaining. 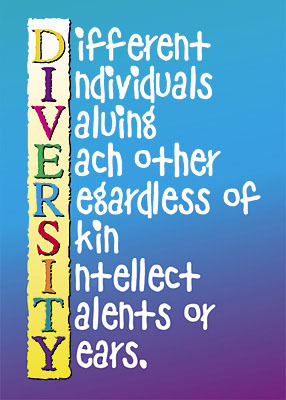 Diversity debunked - is so much broader and dimensional than the way it’s expressed and we are much more inclusive than we think! By the way, if you're looking for a fresh alternative to a traditional team building workshop -- this would be a great one! Also, like my creativity topic, it's a great topic addition to any conference type.